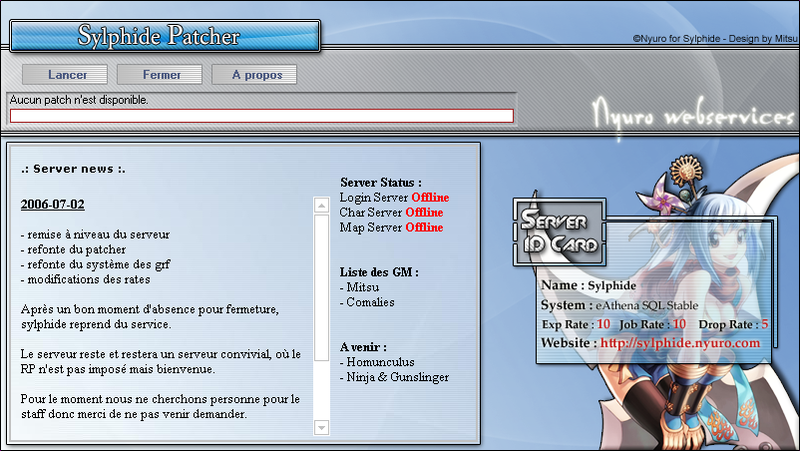 Nitro Concept presents Triad Patcher, client updater for Ragnarok Online. 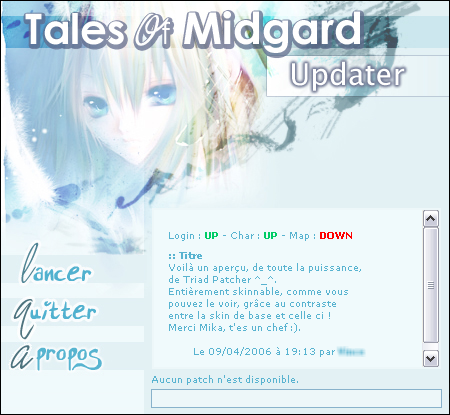 Clic HERE to download Triad Patcher 1.3.0.3. Clic HERE to download Triad Patcher 1.3. Clic HERE to download Triad Patcher 1.2. Clic HERE to access to the Help (incomplete). eAthena > Presentation of Triad Patcher. eAthena > Support for Triad Patcher (Client Support). The auto-updatable Triad Patcher.exe is recognizable by its version 1.3.0.2. - Fixed bad positionement of Triad Patcher on a desktop using multiple screens. the contents of the new file in the old file instead of replacing the old one with the new one. The fixed Triad Patcher.exe is recognizable by its version 1.3.0.1. - Fixed bug making patchs (.TPP) invalid when Triad Patcher getting them. - Form (body) size can now be set. - Arguments can be passed at the executable file. - Bug in the management of patchs to install and do not install (0-1 in \www\patchs_list.ini). - Verification of the new Config.tpc configuration file validity when it's updated. - A typo error in \Configurator\Default\config.ini. - Self-correcting for the destination of the files (Triad Packer). - A tipo error in \www\patchs_list.ini. - A text field in the About dialog can be changed. - The repacks are made after all fusions of GRF files in order to avoid useless repacks. Triad Patcher is divided into three parts listed below. 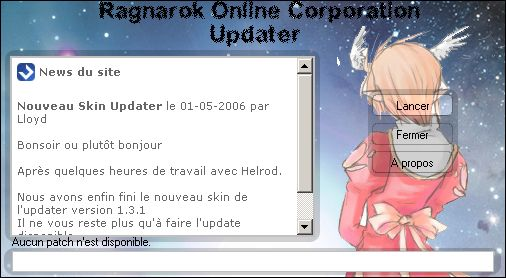 - Auto-restart of Triad Patcher when the Config.tpc*** configuration file is updated. languages file into a binary file (Config.tpc) which will have to be placed with Triad Patcher. - GRF/GPF file fusion management (version 0x200 only). * Triad Patcher uses GRF.DLL, dynamic library developed by Di Vincenzo Mika�l allowing the fusion and the repack of GRF/GPF files. ** GRF/GPF is a file format developed by Gravity and is the property of Gravity. 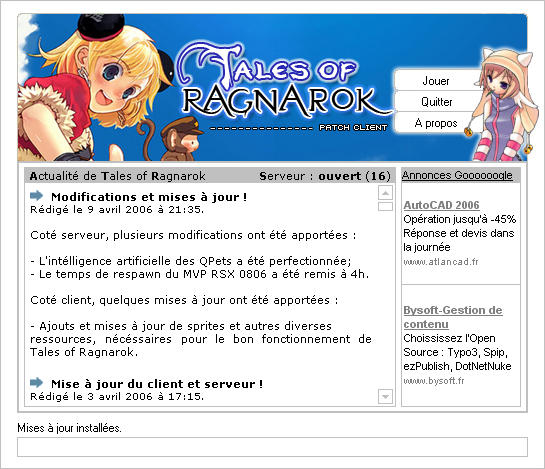 *** The Config.tpc file allow you to not put the skin, the banner (if activated), the configuration and the languages file to the rough format, at the disposal of the players (that constitutes a safety against plagiarism). It's also faster for the loading of these data. � 2006-2007 Nitro Concept Group - All rights reserved.